The last couple of months have been very busy, alongside normal life I have been working on a few projects for magazines, and this last weekend marked the publication of the first two, which made for a rather exciting few days! The first project was for the fabulous Quilt Now, and was a Baby Quilt set, with cushion and taggie blanket, in Aqua, Coral and Light Grey- not a colour palette I usually work with, but it makes for a really lovely combination, and definitely makes for a refreshing change from girly pink. 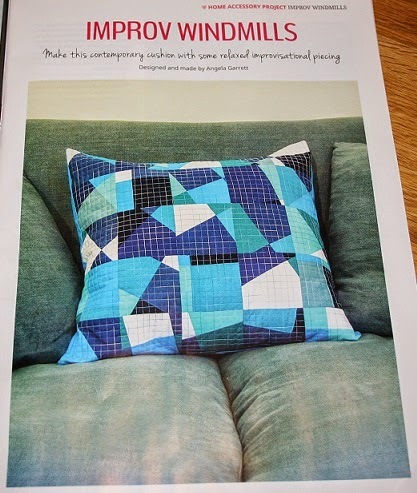 The second pattern is in Popular Patchwork, and is a rather fun Improv Windmill Cushion, made in various shades of blue and white as a contrast, with a pretty, variegated thread. Right, lets see if I can re-motivate myself to do some more sewing, I'm behind on bee blocks, eek! I read the pattern for the cushion and I'd have never thought of working in that way before! Your projects look lovely, and congratulations on getting published! many congratulations on your publications :-) So exciting!